Astrobase is a Python package for analyzing light curves and finding variable stars. It includes implementations of several period-finding algorithms, batch work drivers for working on large collections of light curves, and a web-app useful for reviewing and classifying light curves by stellar variability type. This package was spun out of a bunch of Python modules I wrote and maintain for my work with the HAT Exoplanet Surveys. It’s applicable to many other astronomical time-series observations, and includes support for the light curves produced by Kepler and TESS in particular. Most functions in this package that deal with light curves (e.g. in the modules astrobase.lcfit, astrobase.lcmath, astrobase.periodbase, astrobase.plotbase, astrobase.checkplot) usually require three Numpy ndarrays as input: times , mags , and errs , so they should work with any time-series data that can be represented in this form. If you have flux time series measurements, most functions also take a magsarefluxes keyword argument that makes them handle flux light curves correctly. The astrobase.lcproc subpackage implements drivers for working on large collections of light curve files, and includes functions to register your own light curve format so that it gets recognized and can be worked on by other Astrobase functions transparently. Guides for specific tasks are available as Jupyter notebooks at Github: astrobase-notebooks. The full API documentation generated automatically from the docstrings by Sphinx is available. The code for Astrobase is maintained at Github. astrobase.hatsurveys: modules to read, filter, and normalize light curves from various HAT surveys. This package contains parallelized implementations of several period-finding algorithms. 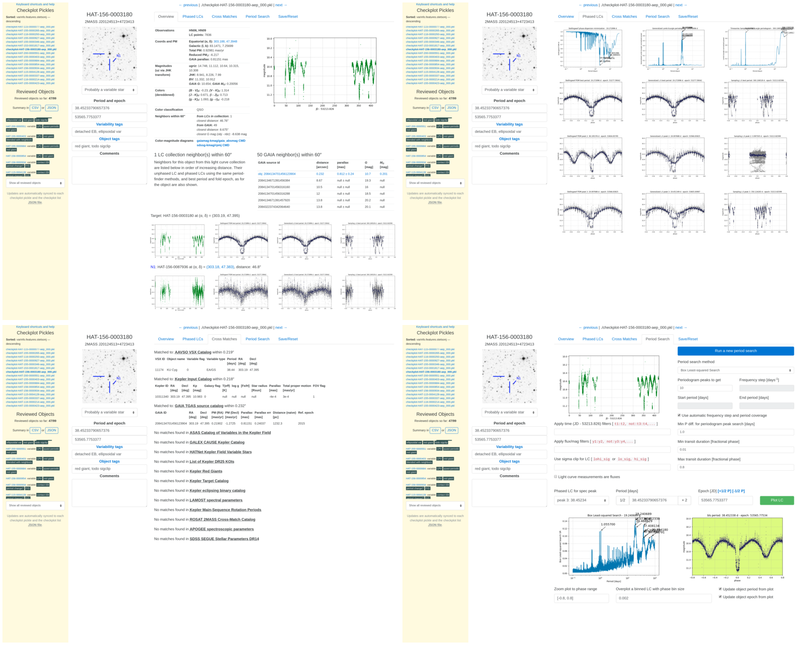 astrobase.lcfit: functions for fitting various light curve models to observations, including sinusoidal, trapezoidal and full Mandel-Agol planet transits, eclipses, and splines. astrobase.lcmath: functions for light curve operations such as phasing, normalization, binning (in time and phase), sigma-clipping, external parameter decorrelation (EPD), etc. astrobase.lcmodels: modules that contain simple models for several variable star classes, including sinusoidal variables, eclipsing binaries, and transiting planets. Useful for fitting these with the functions in the astrobase.lcfit module. astrobase.varbase: functions for dealing with periodic signals including masking and pre-whitening them, ACF calculations, light curve detrending, and specific tools for planetary transits. astrobase.plotbase: functions to plot light curves, phased light curves, periodograms, and download Digitized Sky Survey cutouts from the NASA SkyView service. astrobase.lcproc: driver functions for running an end-to-end pipeline including: (i) object selection from a collection of light curves by position, cross-matching to external catalogs, or light curve objectinfo keys, (ii) running variability feature calculation and detection, (iii) running period-finding, and (iv) object review using the checkplotserver webapp for variability classification. This also contains an Amazon AWS-enabled lcproc implementation. Python pickles: If you want to interactively browse through large numbers of checkplots (e.g., as part of a large variable star classification project), you can use the checkplotserver webapp that works on checkplot pickle files. This interface allows you to review all phased light curves from all period-finder methods applied, set and save variability tags, object type tags, best periods and epochs, and comments for each object using a browser-based UI (see below). The information entered can then be exported as CSV or JSON for the next stage of a variable star classification pipeline. PNG images: Alternatively, if you want to simply glance through lots of checkplots (e.g. for an initial look at a collection of light curves), there’s a checkplot-viewer webapp available that operates on checkplot PNG images. astrobase.cpserver: contains the implementation of the checkplotserver webapp to review, edit, and export information from checkplot pickles produced as part of a variable star classification effort run on a large light curve collection. Also contains the more light-weight checkplot-viewer webapp to glance through large numbers of checkplot PNGs. astrobase.varclass: functions for calculating various variability, stellar color and motion, and neighbor proximity features, along with a Random Forest based classifier. astrobase.services: modules and functions to query various astronomical catalogs and data services, including GAIA, SIMBAD, TRILEGAL, NASA SkyView, and 2MASS DUST. astrobase.coordutils: functions for dealing with coordinates (conversions, distances, proper motion). astrobase.timeutils: functions for converting from Julian dates to Baryocentric Julian dates, and precessing coordinates between equinoxes and due to proper motion; this will automatically download and save the JPL ephemerides de430.bsp from JPL upon first import. astrobase.fakelcs: modules and functions to conduct an end-to-end variable star recovery simulation. To use the astrobase.lcdb module, you’ll need psycopg2-binary or psycopg2 . To use astrobase.lcfit.transits.mandelagol_fit_magseries() for fitting Mandel-Agol planetary transit models, you’ll need batman-package , emcee , corner , and h5py . To use the Amazon AWS enabled light curve work drivers in the astrobase.lcproc.awsrun module, you’ll need paramiko , boto3 , and awscli , as well as an AWS account. Also see this AAS Journals note on citing repositories. If you use any of the period-finder methods implemented by astrobase.periodbase, please also make sure to cite their respective papers as well. Please see https://github.com/waqasbhatti/astrobase/blob/master/CHANGELOG.md for the latest changelog for tagged versions. Astrobase is provided under the MIT License. See the LICENSE file for the full text. © Copyright 2019, Waqas Bhatti, and contributors Revision 57818500.